Anaphylaxis during anaesthesia is a rare but serious problem. In contrast to the developed countries where databases of perianaesthetic anaphylaxis are preserved, none exist in India. We conducted a survey amongst Indian anaesthesiologists to study the incidence and aetiology of anaphylaxis during anaesthesia in India. To study, this doctors Ranju Gandhi, Bimla Sharma, Jayshree Sood J, Raminder Sehgal , Parul Chugh sent written questionnaire comprising 20 items was mailed electronically or distributed personally to 600 randomly selected Indian anaesthesiologists. The responses were compiled and analysed. The doctors received responses from 242 anaesthesiologists. One hundred and sixty-two (67%) anaesthesiologists had encountered anaphylaxis during anaesthesia. Anaesthetic drugs led to 40% of reactions, and 60% of reactions were attributed to non-anaesthetic drugs. Responses showed that Opioids were the most common anaesthetic drugs implicated in anaphylaxis during anaesthesia, and non-depolarising muscle relaxants were the second most commonly implicated agents. Colloids, antibiotics and blood transfusion were the common non-anaesthetic agents thought to be responsible for anaphylactic reactions during anaesthesia. There were five deaths due to anaphylaxis during anaesthesia. Only 10% of anaesthesiologists ordered for allergy testing subsequently though 38% of anaesthesiologists had access to allergy testing facilities. 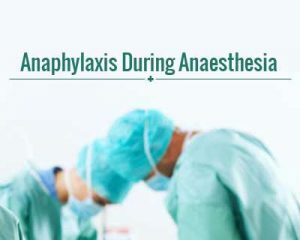 The reseachers concluded that survey revealed that two-thirds of participating Indian anaesthesiologists had witnessed anaphylaxis during anaesthesia. Commonly implicated anaesthetic drugs were opioids and non-depolarising muscle relaxants while colloids, antibiotics and blood transfusion were the common non-anaesthetic agents causing anaphylactic reactions during anaesthesia. Further, the survey revealed low utilisation and paucity of referral allergy centres to investigate suspected cases of anaphylaxis during anaesthesia. The study has been published in the May 2017 issue of the Indian Journal of Anaesthesia, the official journal of Indian Society of Anaesthesiologists. Anaphylaxis during anaesthesia is very rare.I am practicing Anaesth for 27 years.I have encountered once only.